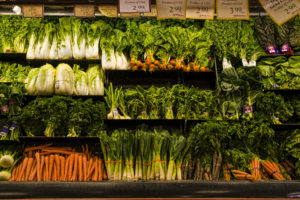 The Food Price Report 2019, recently released by Dalhousie University and the University of Guelph, suggests that vegetable prices will go up by as much as 6% next year. Unlike meat or fish, fewer alternatives exist when it comes to replacing vegetables. According to the report, El Nino will be to blame, since Canada imports a great quantity of vegetables from certain regions prone to drought during El Nino periods. This includes primarily the Western United States and Northern Mexico. And, yes, 2019 is going to be an El Nino year. The 6% increase is in addition to the 4.8% hike that vegetable prices underwent already in 2018. Given that we could experience a second consecutive year of significant price increases, many wonder whether eating local produce is the better option. Well…not quite. Global supply chains have allowed us to become more efficient and have given consumers more choices and affordable food products, but eating local has its advantages, too. The environmental case for eating local is almost undisputed. You can significantly reduce your carbon footprint just by increasing your locally-grown food consumption. One other advantage of local foods is price consistency. That’s right, prices are perhaps generally higher but much less volatile when short-circuit distribution systems are involved. This makes sense, as the number of intermediaries is limited, compared to global food chains. Global supply chains are exposed to environmental fluctuations, and differing economic conditions, which can all lead to more trouble. Extensive, large-scale networks will always give markets what they need at the right time, at the right place, at a decent price, and with an acceptable level of quality, until something goes terribly wrong. A single failure can lead to a hugely disruptive scenario, affecting many people. Case in point: the romaine lettuce disaster in November. Grown in California and Arizona, fresh lettuce is delivered to Canadians at a decent price. But with the recent e-coli outbreak in romaine lettuce, not only did some people get sick, but the prices of leafy greens in Canada are now skyrocketing. With the Canadian Food Inspection Agency preventing romaine lettuce from coming into Canada, importers must procure similar products elsewhere, and are likely paying more to get these precious salad greens into our stores. Trying to meet consumer expectations is what drives importers to look for alternatives. Consumers will want their leafy greens, even in winter, no matter what. Eventually, the situation will go back to normal and most will have forgotten about the romaine lettuce crisis. That’s the nature of market failures. Systems adapt and improve over time. Many envy the stability and sustainability of local food systems. They are easily containable, and frankly, conveniently manageable. Unlike global supply chain systems, transparency is a non-issue, since most producers usually know each other. Buying locally-grown vegetables whenever available can also give some peace of mind to budget-strapped shoppers. You will likely pay more, but at least prices, for the most part, are highly predictable. Simplicity has its virtues, but it also comes at a cost. Local foods are typically 20% to 40% more expensive than the cheapest imported substitutes available in the same marketplace. Research shows that city dwellers are more likely to favour locally-grown or manufactured food products, for the simple fact that agriculture is often a distant concept to them. In fact, many Canadians have never actually been to a farm. Buying local is the one way to feel a real connection with agriculture and farmers. There is also more wealth in cities versus rural communities, which makes price a secondary factor. Although price remains a consideration for urban dwellers, it is more important to less wealthy consumers living in rural areas. And that is where global supply chains come in. The fact that Canada is an open economy has both advantages and drawbacks. Given that Canadians have access to the fifth most affordable food basket in the world, relative to household income, global supply chains appear to be serving them well. So, don’t despair: getting our vegetable fix from all over the world is not such a bad idea. Our nordic climate does not give us many options. But global supply chains do come with their fair share of risks, which in turn generate price volatility. And buying local produce can be critical to our agrifood economy. In many parts of the country, it is apparent that local vegetable production is a priority, through vertical farms, greenhouses using novel technologies, and other initiatives. Access to more locally-grown vegetables, and striking a balance between local and global, will be key. But price hikes affecting vegetables are a challenge for many right now, especially those with limited means. As such, visiting the freezer aisle may not such a bad idea. It may not taste the same as the fresh version, but you will get the same nutritional value out of these frozen veggies. Finally, one piece of good news: authors of the Food Price Report 2019 do suggest that the price of both meat and fish products will drop next year, by up to 3%. This is a first in the study’s nine-year history. So, meat lovers can rejoice and can do their own happy dance around the BBQ come next summer. Just don’t forget to eat your veggies.